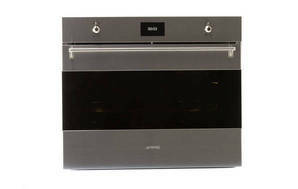 Snapshot: The Smeg SFPA7395X single oven has pyrolytic self-cleaning. But how did it perform in our test kitchen? Door can be removed for easy cleaning. Fingerprint-resistant stainless-steel exterior is easy to clean. Grill element can’t be lowered for cleaning (but tray above grill element can slide in and out for easy cleaning of the ceiling). Grill element is exposed (even though the element has a shield). Visibility through the oven door just OK.
Telescopic runners can be fiddly to remove and clean. Cooling fan during pyrolytic cleaning is noisy. Continuous noise from cooling fan. The grill tray can be pulled out (even though it has stoppers). Oven performance (60%): Based on toast, scones, meringues, roast chicken and pizza. Ease of use (40%): Evaluated controls and displays, ease of using the grill and oven shelves, replacing light bulbs, and cleaning.